PE71S6322 electromechanical RF relay switch from Pasternack is a SP6T design. Our SP6T electromechanical RF switch uses 2.92mm connectors at 50 Ohm. This 2.92mm RF relay SP6T switch has a maximum frequency of 40 GHz and maximum power of 3 Watts. 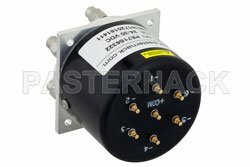 The Pasternack radio frequency SP6T 2.92mm electro-mechanical relay switch is rated at a control voltage of 28 Volts, indicator voltage and switching speed of 15ns. 2.92mm SP6T electro mechanical RF relay switch features Self Cut Off, Indicators, Reset with an isolation minimum of dB. 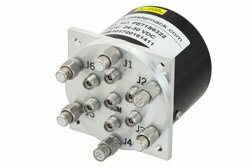 SP6T electromechanical relay radio frequency switch PE71S6322 is part of over 40,000 RF, microwave and millimeter wave components available from Pasternack. Our SP6T 2.92mm coaxial RF relay electromechanical switch can ship worldwide the same day that it is bought as with our other available RF parts.